BRIAR HILLS ESTATES - Surrounded by tranquility and privacy, and beautifully landscaped for outdoor enjoyment, this luxury home welcomes you. Situated perfectly on a picturesque lot, this two-story walkout home offers you plenty of space. There is even an oversized 3 car garage with added storage! 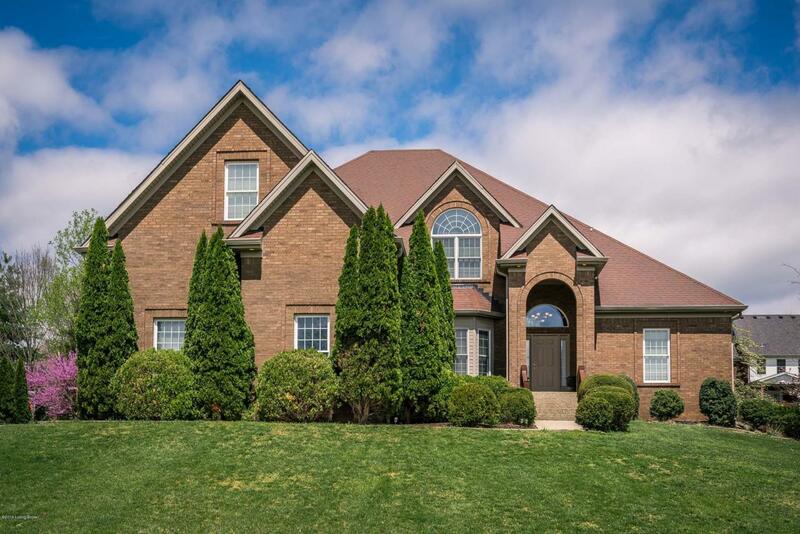 Discover an impressive home with plenty of room for a growing family.With over 5,000 square feet of living space, this 6 bedroom, 5.5 bath home this home is sure to impress. Guests are greeted with architectural accents throughout. An arched entry leads you into the formal dining room with accents including wainscoting and wall sconces. This is ideal space for hosting holiday dinners. You can even enjoy music throughout the house with speakers located in the dining room, great room, kitchen, master bedroom, and sunroom. The light-filled 2-story great room with built-in entertainment center invites guests with ample space to entertain. There is even a double-sided fireplace to share with the kitchen. Through double arches, enter the eat-in gourmet kitchen complete with double ovens, convection microwave, gas cooktop, raised dishwasher, large granite island with prep sink, handsome tile backsplash, double pantry, and adjoining four-season sunroom! The elegant owner's suite has hip tray ceiling with accent lighting, and a spa-like en-suite bath with double whirlpool tub, attached sitting room, and walk-in closet. The main level is also home to an additional bedroom, full bath, and laundry room with utility sink and storage. The second level offers three spacious bedrooms, one of which is a Jr. suite with attached bath. The second and third bedrooms are separated by a full Jack-N-Jill bath. On the second level, you will also discover a spacious bonus room with attached half bath and wet bar. This would make a perfect theater room or study area. In the finished walkout lower level, discover plenty of additional space perfect for entertaining family and friends. Features include an extended living room with wet bar area, exercise room, bedroom, and full bath. Access the backyard through atrium doors. Outdoor living is a breeze with so many stunning landscaping features including paver path, pergola, patio, and fully fenced yard. Your morning workouts are just steps away in the 17-foot long heated swim spa covered by the decorative pergola. Additional features include: CAT-5 speaker cable, a gas line in the basement behind the wall for future fireplace, irrigation system, and the home is security hardwired. Finally, the home that has everything and elegantly appointed for the most discerning buyer. Conveniently located close to I-71, shopping, restaurants, state-of-the-art medical facilities, and award-winning Oldham County schools. © 2019 Greater Louisville Association of Realtors. All rights reserved. IDX information is provided exclusively for consumers' personal, non-commercial use and may not be used for any purpose other than to identify prospective properties consumers may be interested in purchasing. Information is deemed reliable but is not guaranteed accurate by the MLS or The Sokoler-Medley Team - RE/MAX Properties East. Data last updated: 2019-04-23T15:58:21.053.